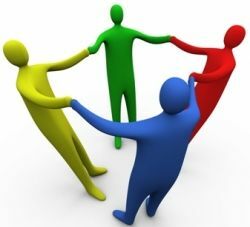 Circloscope is an unique tool, very effective, to manage Google Plus circles. Like any tool, it is dependant on the quality of data input, and the quality of the operator, but overall it saves days of work by automating hours of manual work. Circloscope has three versions, Cricloscop Free, Circloscope Pro, and Circloscope Premium. Circloscope Free, is a fully functional version, with the ability to mass follow, and unfollow inactive. Circloscope Pro is the most advanced version with one google plus personal profile, and up to 15 business pages. This is ideal for Large companies, and agencies. Circloscope Premium is the middle range premium Circloscope version, which allows you to manage one personal profile, and up to three busines pages. Content marketing and social media are the best way to market your brand or product on Internet. Not an easy task, if you ask marketing specialists, but very rewarding, if it’s done properly. Do you write great content and have difficulty propelling it on top of the search results? Do you think your articles are better than other pages listed on Google’s first page? Or maybe you write content in a unique way that would appeal to a certain people segment, but your pages never had the chance to be read. You are not alone, there are many writers, and content marketers with great websites that just don’t have enough readers. There are a few things you can do to push your content on first pages of the search engines, where they belong. One of these things is using social media as a traffic source, and also use the new trends in the search engines world, social signals, as a quality signal. What Are the Social Signals and Why Search Engines Care about them? Social signals are metrics that tell search engines when a subject is hot. In other words, if a particular content piece gets reshared, and gets liked a lot on multiple social media platforms, search engines will interpret that as a positive signal. A new concept, introduced by Google with its Google+ as a social engine, is to match social groups to provide them with similar search results, in order to deliver the most relevant results. Why Are Likes Important and which Social Media Platform is Better? Interestingly, Google has stated that social signals have to validate in time as well, in order to be taken in consideration. 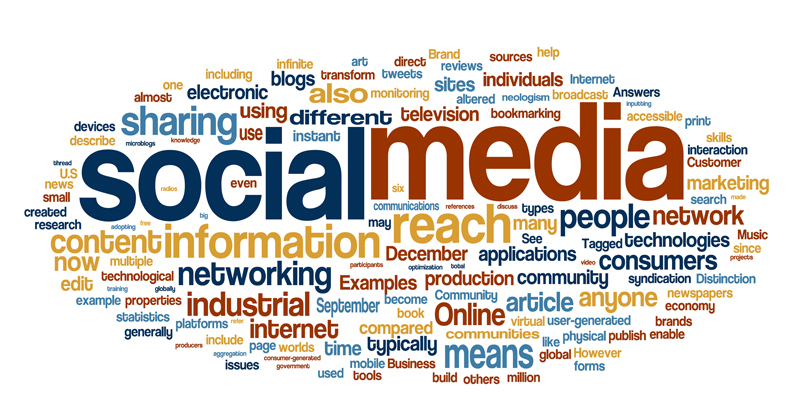 Some SEO specialists think that social signals will start to validate in the third year of social networking activity. If the social signals drop after the first year, all the signals are lost. For a search engine this means that either the subject lost public interest, or the social signals were unnatural. To sum up this, all social media signals are important, and all platform votes say something about your content to the search engines. Let’s take the example of an article that talks about computers. All my Facebook friends know that I am an IT Systems Engineer and if I share a link to a post, I vouch for the reliability of the source. They are more likely to share that with their friends, than repost a link, posted by me, about cars. They know I don’t know anything about cars. The same goes with Google+ and Twitter. Stick with subject that you are familiar with, you can have an objective opinion on, and your friends will identify you with. If I post a link to an article about wedding dresses, all my friends will first think that I must have been drunk when I did it, or someone blackmailed me. On the other hand, if my daughter shares the link it is natural. Of course Google has a way to figure that out, or if it doesn’t have it yet, it will have it soon. Remember the Penguin update? Don’t spam your friends! Think of this as a recommendation in your social network. When someone asks me to recommend them a new laptop to buy, they know they will get the best information, because It’s my job and I know what I am talking about. But if I approach my friends and start talking about the gorgeous wedding dress I just saw in a friend’s store, I would just look weird. Content marketing is a term relatively new to coin the act of creating content to improve sells. There are many writers on Internet that can be placed under the same umbrella, and not only businesses that sell products. The Internet marketers, the writers on social writing platforms, such as Hubpages and Squidoo, many bloggers, etc… use content to attract readers. If the content is interesting it will be rewarded with traffic, hence bring money to the writer, most often from ads. Content marketing is probably the best type of marketing on the Internet, and in theory it is very easy to target your market using it. In practice, there is a lot of competition, and even if you have the best content on web, your articles might not be getting any traffic. If your content is great, social media will reward you with visitors, but you have to be active on social media. Some social media campaigns have gone viral, and they surpassed even the most optimistic predictions. Social media has the advantage that it doesn’t follow any algorithms to rank content, the numbers of shares and likes is the ultimate ranking algorithm. If people like your post, they’ll share it with others, if not they won’t share it, this means that only content that appeal to public will be rewarded. For this reason, social media is a great signal for search engines, if it gets shared and liked, it is because people like it. Make it easy for people to like your content by adding all the social media share buttons pertinent to your website. At a minimum, you should have Google+, Facebook, Twitter, and Pinterest. People will not make the effort to copy paste your URL into a new window, just to share it. If you make it easy for them, they will like and share your page. Social network platforms don’t mean anything if you don’t socialize. These platforms are not your just so that spam them, people will just kick you out of their community immediately. Be part of the community, and interact with it, and not just post there. While you are there take your time to acknowledge other’s posts and work, they will return the favor. If you post every time but never take the time to like other’s people content, they’ll end up by ignoring you, and that’s not good for you. Reward great content regardless of relationship with the author, that makes you look good, as a finder of that post or infographic, and get your profile more authority. Content Marketing Power Tip: The more people in your niche vote for your content, the more relevant your content is in the eyes of search engines. Google+ is the most powerful social network engine for building relevancy. Google+ can determine if a person is an authority on a subject matter or niche. If your video or article gets many reshares and “plus ones” from authorities in the subject matter, the video, or article, will get ranked. Make sure you setup authorship and publisher tags on your website. Don’t look at social media for content marketing as to a competition, if you have more likes and pluses, you will outrank other webmasters. Think of it as a team work, to improve everyone’s rankings. If you look at the big players on the social media, and bloggers, you will see that there are repeated interactions from bloggers in the same niche. These guys know that working together will help everybody’s content in rankings. Make sure you complete your blog profile. Fill in as much as possible, don’t forget the picture, the “About Me” section, and the social media section. If you haven’t done so, create a Facebook account and start making online friends. Create a Twitter account and follow people with the same interests as yours. Create a Google+ profile and fill in all the information on the profile. Start making friends on Google+. Here is a Google Plus for businesses tutorial, start with that. Do not overlook Google Plus, and read this if you want to know why you need Google Plus for your business. Link your Google+ account to your webmaster profile, and viceversa, to give your articles authority and a name. This is what people call Google+ Authorship. Depending on your blog platform authorship might be setup differently. Create a pinterest account. Normally you need an invitation from a member, but you can also use your Facebook or Twitter account to create the account. Update: you can create now an account without any of the above. Use Digg, Delicious, Stumbleupon and Reddit to propel your content. Use the Facebook Fan Box to showcase your page. Use social media hangouts to connect with other webmasters and share your pages with them. I don’t recommend buying social interaction, but instead build a community with people with same interests. Befriend webmasters on Facebook, connect on Google+, follow on Pinterest and on Twitter, don’t be shy, most of the webmasters will love to connect with their peers. Snagless RJ45 connectors are that odd request that my department makes from time to time. Why do you need RJ45 connectors anyway, it’s the invariable answer from supervisors, and the typical reminder: “You have all sorts of patchcords, all dimensions…” Well, first of all, we sysadmins never have all the patchcords dimensions available. The IT racks should be something that should be kept as tidy as possible, and one way is to have custom length of the patchcords. Depending on your infrastructure, you might want or might not want to use handmade patchcords in your racks; however, in many cases this is totally acceptable. You can probably make a Cat 5 patchcord, but you won’t be able to make a Cat 6 one. In other words your hand made patchcords will be able to run at Gigabit speeds, but not at 10 Gigabit speeds, even with the proper connectors and cables. Having said that, most of the equipment in a business server room is connected into a Gigabit switch or at lower speeds, so this would not be a problem. The major problem with all the handmade Ethernet patchcords and cables is that the locking tab is breaking. I probably don’t have to explain why broken tabs are bad; they will not be secured into the equipment’s jack, resulting in intermittent data loss, or even disconnection. There are two reasons for the locking tabs breaking so often. Firstly, the little locking tab is very fragile, and we can’t change that, it is fragile to keep the costs down. The other reason is the design, the locking tab sticks out, and it is very easy to get snagged and broken off. All store-bought cables come with a snagless boot; it’s the standard these days. All the cables with broken locking tabs don’t have the boots, because they are terminated in place, by either a datacom tech, or an admin. 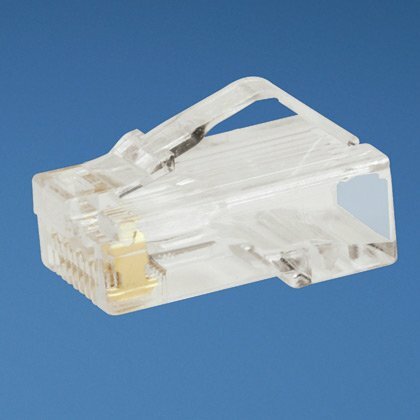 These plugs from Panduit are the best snagless RJ45 connectors. 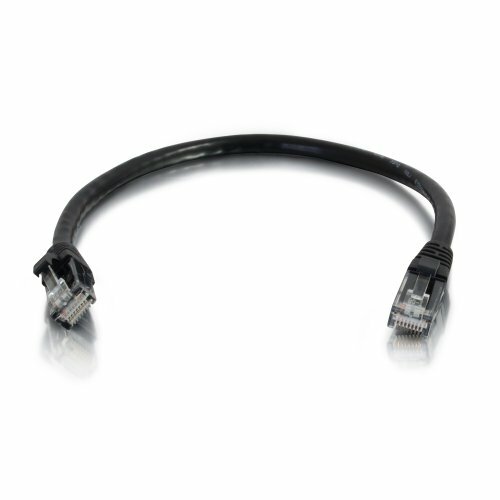 The connectors are meant for patch cords, and they are rated as providing Category 5e performance. The patented tangle-free plug latch prevents snags, hence breaking. They are easy release, unlike some snagless boots, and they save time on frequent moves, adds, and changes. One of the solutions to fix the snagging network cables is to install a "snagless" boot over the cable, before crimping the connector. After crimping, just push the boot over the connector and the boot will protect the little tab. My preferred way to fix this is to use snagless RJ45 connectors, and a boot. This ensures the plug will not break ever, unless you purposely do it. You can also use just the snagless connectors, they are very good, and I do it very often, but if I have both the snagless connectors and the snagless boots, I will use both for optimization. The snagless plugs are slightly more expensive than the regular ones, but when you draw the line, and consider the troubleshooting needed on the long term, and the fact that sooner or later those RJ45 connectors will break and will need to be replaced, the additional cost is worth paying. Like I already mentioned before, with the low prices for commercial made patchcords, and the quality ensured by a machine made ethernet cable, there is no need to make your own, it's just not practical. This cables are made in a commercial facility, they are tested, and they come in a variety of lengths, just choose the one that is right for you. 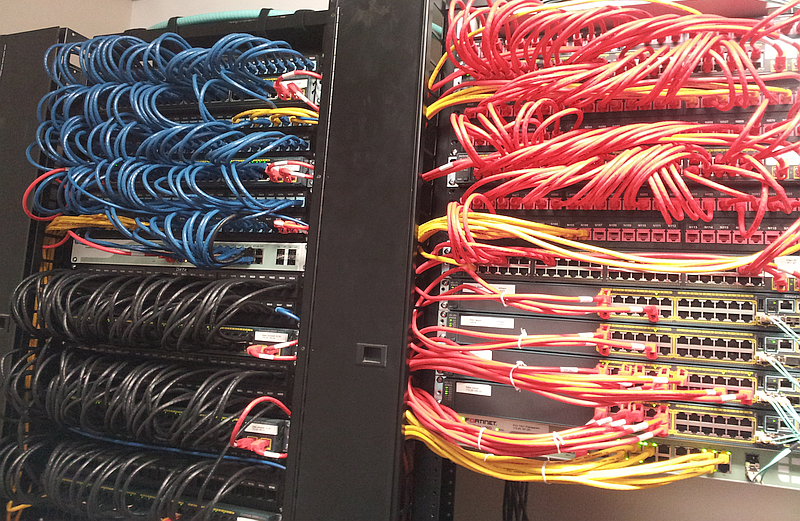 You can even get to choose the color, so you can color code your patch panel connections, so everything looks tidy, and easy to follow.